Joel, Avi and Bryan Glazer had to leave Old Trafford in police vans on Wednesday after fans angry at the £790m takeover protested outside the stadium. The Glazer brothers, sons of new owner Malcolm, were making their first visit to the club since taking it over. Echoes of "die, Glazer die" rumbled around the stadium as about 300 fans vented their frustration. 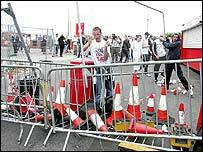 Barriers were erected around the ground as fans tried to stop the Glazers leaving and two arrests were made. It took more than 100 Greater Manchester Police officers and a massive security operation to get the Glazers out of the ground as fans swarmed around the stadium. Some fans pelted police vans with missiles and police in return used batons and scores of dogs to try to get the supporters under control. 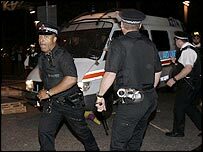 Colin Hendry, from the Manchester United Independent Supporters Association, said he thought police were too heavy-handed. "There were barricades across a road and people were standing and chatting," Hendry told BBC Radio Five Live. "The barricade went up, the Glazers started to move and people sat down in front of the barricade. "But police in riot gear, with batons, without warning, without instruction to disperse, just attacked those people." However, a Greater Manchester Police spokeswoman said: "Police were called to Old Trafford following reports that a number of fans were protesting outside. "High visibility patrols, dog handlers and officers from the tactical aid unit went to Old Trafford to ensure the protest remained peaceful." Joel Glazer, who is expected to be confirmed as chairman of the club, is believed to have spent part of his evening recording an interview for the club's television station, MUTV. The interview will be broadcast on Friday evening. Shareholders United, who oppose the takeover of the Premiership club, insisted Wednesday's protests showed there was still significant ill-feeling towards the Glazer family. "The Glazer family are the enemies of Manchester United," said Shareholders United vice-chairman Sean Bones. "We find them disgusting and repulsive. They may have captured the club but they only have it on a temporary basis. "It might take a long time, maybe two or three years, but we are showing Glazer that we won't give up. "In the long-term the Glazer brand will be suffocated. The previous Manchester United brand was peerless in terms of sporting brand names. "The Glazer brand is toxic and tarnished, uncool and unstylish. Glazer will lose the war." The Glazers were accompanied on a tour of Old Trafford by chief executive David Gill and commercial director Andy Anson, who had been ousted and then reinstated to the United board by Malcolm Glazer. Their visit followed meetings with club sponsors and discussions with English football's governing bodies, plus Sports Minister Richard Caborn. On Thursday the brothers are expected to return to Old Trafford to address staff before heading back to Florida. But former Manchester United player Arthur Albiston fears the Glazer family will never be able to actually watch a match at the ground. "I can't see Glazer or his sons actually turning up at Old Trafford because the repercussions would be enormous," he told BBC GMR. Are fans right to protest against Glazer in this way?